Page’s represent youthful energy and inquisitiveness, the ability to seek new paths and learn new things. This is a good time to learn a new hobby or skill that will help you be proactive in regards to health. Those with this card here need a physical outlet and require regular activity to maintain a healthy body and mind. Cups people are often prone to anxiety and stress related illnesses. 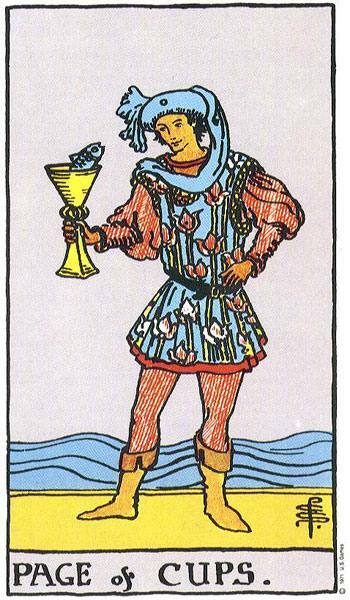 Page of Cups speaks of creativity and new thought. Challenge your mind regularly to find “outside the box” ideas and solutions to problems. Use your creative or artistic talents as channels for your emotions to help you better understand your mind and how it works for you or against you. 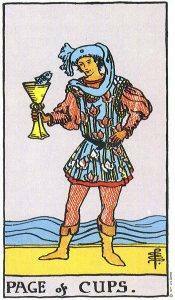 Page of Cups is an adventurous soul who is easily prone to becoming bored or restless. When this happens it can lead to a sort of melancholy and even spiritually disconnected feeling. Ensure you are doing things that allow you to embrace your natural need for adventure. Satisfy your curiosity through travel, exploration or simply engaging in new activities before boredom becomes apathy.